One key theme that created ripples in the world of HR last year has been 'future of work'. While people contemplated on the timing of its "arrival", one thing was clear - the work of the future will have no boundaries (of organisational structures, geographies)' it will be fluid. Agility will be the only constant in this ever-evolving world, and with the changing social and talent structure, organisations will find it increasingly difficult to have talent strategies that will not only help them survive but also remain competitive. 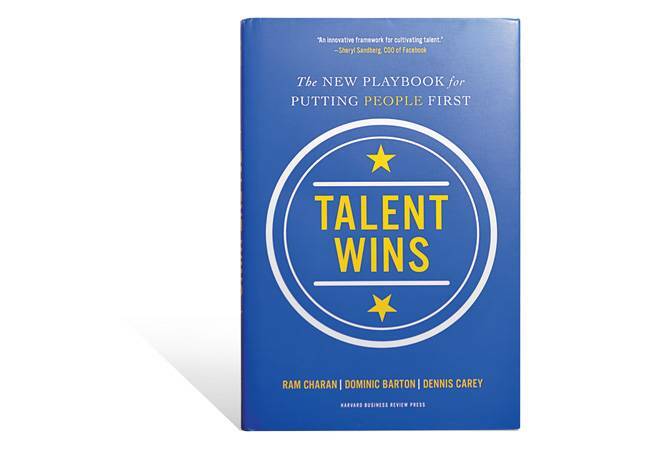 As the business world grapples with the realities of this future, Talent Wins, by Ram Charan, Dominic Barton and Dennis Carey, has arrived at the right time to act as a guidebook or playbook to having an effective talent strategy for a future-ready place of work. In the words of the authors, "Talent Wins will show you what it really takes to create and lead an organisation that lives by one simple but profound concept: People not companies generate value." While this follows the earlier write-ups by Charan - 'It's time to split HR' and 'People before Strategy' which are widely acknowledged in the fraternity - this book is unique in the way it establishes the need to deploy human capital as consciously as deploying financial capital. At face value, this advice of the authors may sound cliched, but the book delivers on its promise. The book offers a seven-step process to transform and steer a "people-first" company. Be it the advice to form a G3 (CEO, CFO and CHRO) to drive agenda, to elevate HR to the same level as finance (encouraging formation of a G2:G3 sans the CEO), to introduce your board to a new TSR (Talent Strategy Risk), instead of Total Shareholder Return, or to dismantle organisation pyramids to form a horizontal and flexible structure (that connects and multiplies talent) - the book is full of incidents from leading global organisations that are easy to understand and implement. One of the highlights of the book is that it does not shy away from highlighting key issues that often remain covered. In today's world, where machine learning is making great strides, the book emphasises on getting the data right using a technology that can provide a single view of the truth. It guides leaders to identify the top 2 per cent of talent and demands removal of bureaucratic systems to unleash their potential. The book gives a clear message to the CEOs that nothing in the HR agenda is trivial and that they would need to be chief recruiting officers for critical talent, developers of GPS for external talent and might even need to make the board their talent management consultants. Towards the end, it also provides a checklist for CEOs as they steer their teams towards the people-first agenda. While the book covers almost all major aspects shaping the talent world in detail, it has somehow missed mentioning the changes that will impact talent strategy as the gig economy gains a strong foothold. Also, the book would have garnered interest from a wider audience if there were instances from the perspective of growing small to mid-size organisations (approximately 85 per cent companies globally) that have limited resources to invest on people. Nevertheless, Talent Wins could be a good reference point both for business and HR leaders who dream of establishing a talent-first workplace, where sensing and seizing new opportunities is the norm. As the authors say, managing a talent-led strategy is not for the faint-hearted; its foundations lie in well-thought decisions, and execution is driven by constant focus and agility of the leader. After all, the goal is to feel alive to the highest potential within your company every minute of the day. That's no mean feat, but it's good to have a playbook along.